Given the focus on opinion polls—a topic which I am thoroughly immersed—it is nevertheless important that we remember that the major party presidential nominees are neither chosen by polling results, nor by plurality elections in the 50 states. Rather, the nominees will be chosen in July by party delegates gathered in the respective conventions—in Cleveland for the Republicans and in Philadelphia for the Democrats. 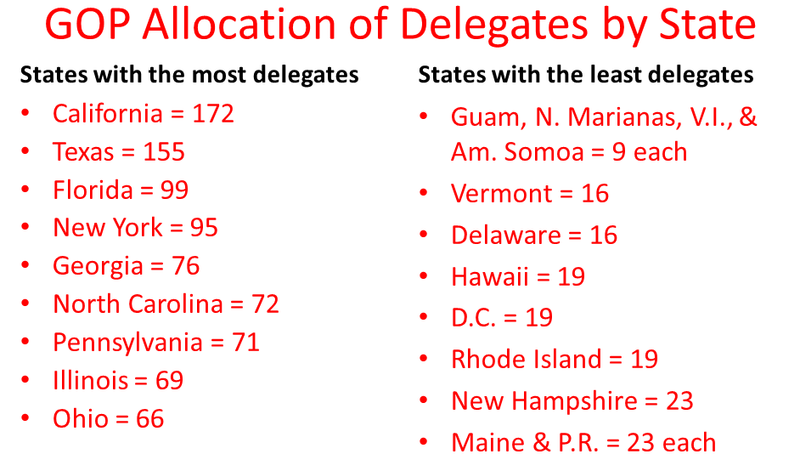 The primaries, caucuses, and in a few cases conventions, will determine which delegates go to the conventions. Now to correct myself, the 39 primaries, 14 caucuses, and 3 conventions will select 93 percent of the Republican delegates and 85 percent of the Democratic candidates. In each state and territory, the top three Republicans will automatically go to Cleveland regardless of the state votes. On the Democratic side, 713 party leaders and elected officials (PLEOs), or 15 percent of the 4,764 Democratic Party delegates, will go to Philadelphia regardless of anyone’s vote; these are called the Super Delegates, and they are unbound by any popular will and free to vote their conscience. The rules for allocating the number of delegates to the various states and territories are made by the national parties. The rules for selecting those delegates are made by the state parties. There is no single entity determining how the process works. Before March 1st, which is being called Super Tuesday or SEC Tuesday to reflect the large number of delegates at stake and the large number coming from southern state, only 133 of the 2,472 GOP delegates (5 percent) are in play. I do not mean to deny the importance of these primaries and caucuses, but if a candidate were to sweep these contests, they would still be a very long way off from securing the nomination. As a rule, early states allocate delegates by various versions of proportional representation, although South Carolina a winner-take-all statewide and at the district level. After the big Super Tuesday contests, only 822 (or one third of the votes) will be selected in the Republican nomination process. Consequently, even is one GOP candidate rises far above the pack, they will still have to amass another 415 delegates in order to have the barest of majorities and a thin claim on the nomination (thin only in that they would need to hang on to each and every delegate). By March 15, a majority of GOP delegates will have been selected, although the large GOP field will make it very unlikely that any candidate would have secured a majority by this point. It is likely that no Republican candidate will have the majority until at least April, and it is very possible that we won’t know the Republican nominee for sure until the June 7th, winner-take-all California primary. It is also possible that no GOP candidate has a majority of the pledged delegates going into the Cleveland Convention July 18, 2016—a political scientist can dream. I will say more on the Democratic race in another blog piece. It has been said that, “the people of Iowa pick corn, the people of New Hampshire pick presidents.” We have traced that saying back to then New Hampshire Governor John Sununu in a New Hampshire Union Leader article from January 6, 1988, although we are not sure it originated with Sununu. This saying has been repeated many times since, but there is little evidence to support the assertion. While New Hampshire does has a better track record picking the Republican nominee (80 percent to 60 percent since 1976), on the Democratic side, Iowa has the better track record (80 percent to 70 percent). Without diminishing the influence of the first two contests in the presidential race, neither Iowa nor New Hampshire is statistically significantly better at picking the eventual nominee, due simply to the fact that there are so few cases to analyze. In addition, any statistical comparison of the nominating process will suffer from the fact that each contest is very different. It can be said, that since 1976, either Iowa or New Hampshire has picked the eventual nominees in every case except the 1992 Democratic race, where Thomas Harkin won the Iowa Caucus, Paul Tsongas won the New Hampshire Primary, and Bill Clinton won the party’s nomination. For the Republicans, New Hampshire has shown to be more likely to select the eventual presidential nominee. In contests where there was some opposition, New Hampshire selected the GOP nominee in 75 percent of the races since 1976, whereas Iowa has selected the nominee in only half of the contests. While this difference is not statistically significant (p= 0.33) because of the small number of cases, it is often seen as a meaningful difference. Iowa’s relative disadvantage in picking the ultimate party nominee on the GOP side is largely due to the fact that the Republican base has a higher percent of Evangelical voters, who tend to favor candidates with more extreme socially conservative agendas. The Edison Media Research exit polls put the level of white Evangelicals at 56 percent of those participating in the GOP Iowa Caucus. The Pew Research Center for Religion and Public Life put the number of Americans identifying as Evangelical at only 25 percent, and 28 percent in Iowa. Thus, white Evangelicals are disproportionately over represented in the GOP caucuses. The two cases since 1976 where the GOP winner of the New Hampshire primary was not the eventual nominee were 1996 and 2000. In both cases, there was a relatively crowded field, and the ultimate nominee placed second. Iowa has the better track record on the Democratic side. When we eliminate unopposed candidates, Iowa has picked 75 percent of the Democratic nominees since 1976, compared to New Hampshire’s 62.5 percent record; however, these differences are not statistically significant (there is a 62 percent probability that the differences are merely chance). The case of 1992, where the eventual nominee, Bill Clinton, won neither the Iowa Caucus nor the New Hampshire Primary was an odd case, since an Iowan was running in his own state—U.S. Senator Tom Harkin—and the winner of the New Hampshire Primary was from the neighboring state of Massachusetts. While voters in Iowa and New Hampshire take seriously their roles in selecting party nominees for the presidency, neither state is very representative of the American electorate. Both states have lower proportions of Hispanics and African Americans than found in the nation as a whole (by about 10 percentage points). Additionally, both states are more rural than the nation as a whole. This presents more of a problem on the Democratic side than for the Republicans because Democratic voters are more urban and less white than the nation as a whole. Consequently, the early contests between Hillary Clinton and Bernie Sanders will be decided by a Democratic electorate that is not very representative of the larger Democratic party. Because it is whiter and more rural, it is likely to favor Sanders, whose own state of Vermont is very white and rural. It is conceivable that Sanders could win both Iowa and New Hampshire, but his prospects grow dimmer after that. First, let’s look at Iowa. Although Clinton has a 13 percentage point advantage over Sanders based on Real Clear Politics averages (accessed January 4, 2016), she only leads by 9 points in the Des Moines Register poll conducted by Ann Selzer, whose polls have a fabulous track record. Determining who will show up to caucus in Iowa is a tricky endeavor, since caucusing takes much more dedication than showing up to a ballot box and casting a secret vote. Caucusing can take hours, and as the Obama campaign showed in 2008, if you have an advantage in enthusiasm and if you can bring new people to the caucus, anything can happen. So it is too early to discount Sander’s polling deficit in Iowa. As for New Hampshire, Sanders maintains a slight lead in the polls, based on the Real Clear Politics averages (accessed January 4, 2016). Sanders comes from a neighboring state and has brought a lot of supporter in to canvas for the campaign. Unlike Howard Dean in 2004, who had to face John Kerry who also came from a neighboring state, Sanders’ opponents are not from New England. While Sanders is still not well-known nationally, he is pretty well-known in New Hampshire. To sum up, the early contests are very important to the campaigns to establish viability, build momentum, and raise money, but these contests are not determinant. There is a lot of voting still to follow after the New Hampshire primaries.